In November I will taste this 2009 - along with many other cru classés from this famous Bordeaux vintage - at the UGC tasting in Bruxelles. I am looking forward to explore all these 2009s, about 1,5 years after having tasted them at the UGC primeur tastings in Bordeaux. Anyway, I will post my findings on this blog. Back to Rauzan-Ségla. It's an interesting wine, but not an easy one to taste en primeur. It's a Margaux that needs serious cellaring, it doesn't show its charm as a baby. In its youth you can sense that there truly is a lot to this wine, but it's all nicely wrapped up into a powerful core. When you look at the wine, you look at a bud. A beautiful, healthy and promising bud. Nothing more and nothing less. Perhaps I get a first glimpse of the flower next month. 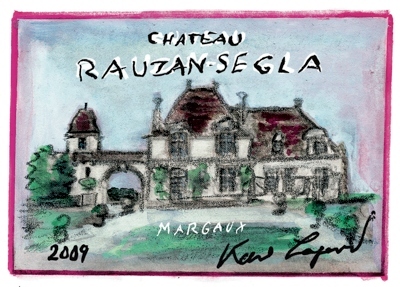 There's one aspect that I like less about the recent Rauzan-Ségla vintages, and that's the price. The release price for the 2009 was high, and for the 2010 was very high. On 16 June 2010 the 2009 was released at an average consumer price of €83,50 (66,7% above the 2008 vintage), and exactly one year later (16 June 2011), another 40% was added, resulting in an average consumer price of €116,50. At the time this led to negative reactions, and demand was slow. In comparison the 2008 is very good value, and there are still some cases available in the Bolomey Wijnimport cellar. My brief tasting note at the UGC tasting from November last year: "dark and quite supple, matière, blackberries, energy and power, long". A wine to be enjoyed between, say, 2015 and 2030. That is: almost one bottle every year. I think I will keep at least one case to myself.